I'm Yvonne @ StoneGable a blog about American farmhouse living. I love all things home and diy's. Come live large with me and be inspired! Yvonne Pratt has hosted 276 Episodes. If you've decorated for fall, it's time to start thinking about how you'll transition your fall décor into Thanksgiving décor. No cross-holidation for us! Be sure to listen to the episode to hear about our own transitions here at DTT. Fall is a great time for cozy recipes. We love to cook and bakes, especially in the fall. Today we'ere sharing our very favorite fall recipes. So get ready for some mouth-watering recipes. Accessories make a room. They are what give your spaces personality. Accessories can tell a story an evoke a vibe. You want yours to be telling the right tale. So listen in for ideas & inspiration on the real fun part of decorating ~ accessories! The Holiday's will be here before you know it! Are you thinking about them yet? If you start to get organized NOW you will have a more merry and less harried Holiday! So let's start making a list and check them twice! We love to decorate the entire house, so we don't want you to leave out your hallway. It should look just as amazing as the rest of your home! Today we're sharing some of our favorite ideas for upping your hallway game. Living large in the living room ! This has nothing to do with size, but how you outfit this room for function, comfort & style. See yours with new eyes today. That new perspective coupled with our help may just make this your favorite room in your house. Organized closet - organized LIFE ! Most often you'll start your day there, so start it right. Today we have secrets & tips to help you get it together in your closet. Listen in and then head to your closet ! We're the tip girls and today we're offering tips, tips, tips fast and furiously! We've got ideas from for your entire house and even your front porch. Check them out. Today's tips are all about slipping beautiful, things, moments & opportunities in your everyday. If you do you will most definitely elevate your everyday and end up feeling happier. We go through your day from morning to night and every moment in between with ideas ... and yes, lots of laughs! Laughing along with us most definitely will make you & us happier! One of our favorite things about Fall is being able to put on some candlelight or other soft lighting when the evenings get shorter. You would be surprised by how many ways we can light up Autumn's nights! We can't wait to share them with you! 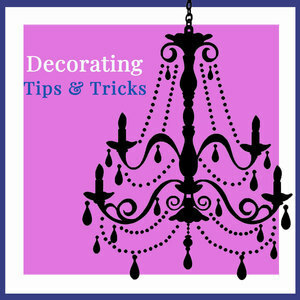 We have all made decorating blunders; some of us have made a lot of them. Because we are had so many blunders, we're well versed in how to fix them. The great news is that most of them can be fixed. Welcome ~ Come RIGHT in! And we mean "right in", as in there is no entry space. No entry - No problem! Listen in for our tips & how to create the feel of an entry where there is seemingly no square footage for one. Style is NOT dependent on a big budget. We have wonderful ideas, inspiration and tips for decorating without spending lots of money. This is wonderful time in history to decorate without spending much. Listen in to save & have wonderful style!